Our first time dry camping with Thistle. 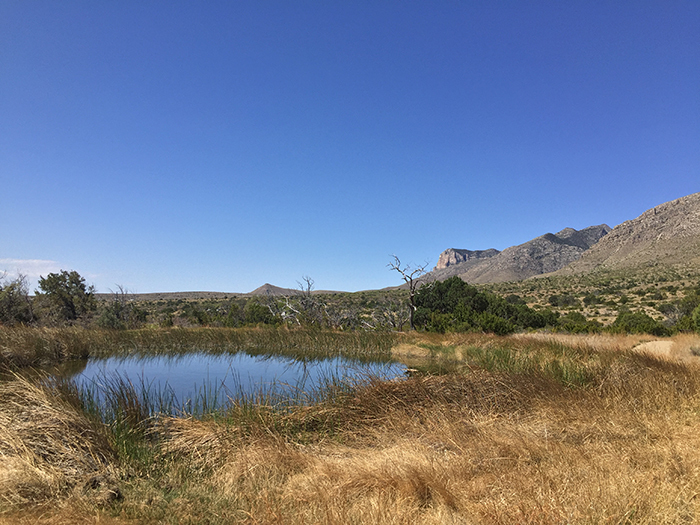 We spent three nights in the Guadalupe Mountains National Park. Ok, there weren’t any literal fires on this trip, but the first 30+ hours weren’t the most delightful. To start, we haven’t been on any trips of significant length since Colorado of last summer, aside from a short weekend trip for one of my trail races just an hour north of where we live. The trip started off really well, aside from some traffic getting out of Austin, and having to make more pit stops then usual. But then the wheels came off…literally. About 350 miles into our 450 mile trip we started experiencing some vibrations in our steering wheel, which soon turned to a, THUMP THUMP THUMP down the highway. We pulled over and after some time figured out one of our tires had a huge bulge in it. We were actually relieved, because prior to that I was in the process of calling our insurance company about a tow, and trying to figure out in my mind where I was going to put my family for the night, how we were going to get there, and how in the heck was I going to get my RV back to Austin with a bum truck. I was stressed to the max, all the while my children enjoyed frolicking on the side of the highway without a care in the world. Oh, and to make matters more tense: while stopped on the side of the road we discovered sometime in the past 25 miles our RV awning had popped lose, fully opened and then completely ripped off the RV. The tire ended up getting taken care of with a little help from that phone number on the back of your drivers license for roadside assistance. 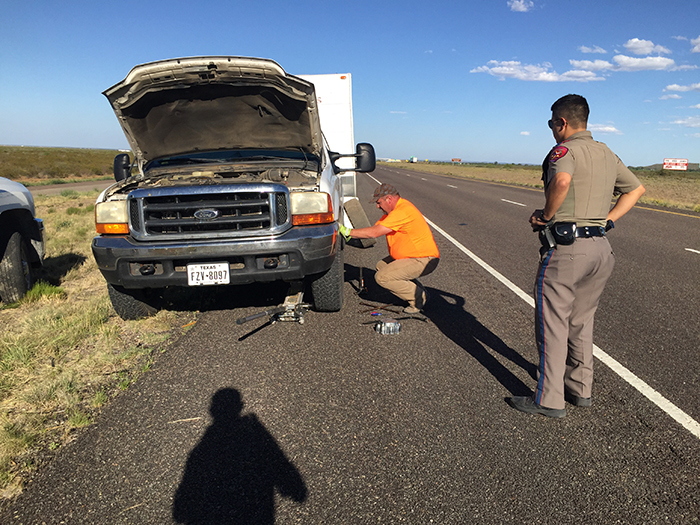 They call was routed to the county sheriffs department, that then got the call out to the right person and send a DPS trooper to help out. He didn’t have the tools to change the tire though so called for a wrecker, and about 15 minutes later a guy arrived in a truck and changed the tire in about 10 minutes. Getting some roadside assistance with. Tip: In Texas you can call the number on the back of our license for help. 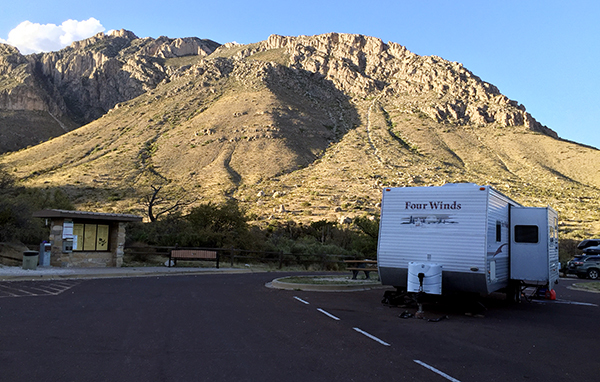 After the tire was changed we had about 100 miles remaining, and all was smooth sailing until we arrived at the RV park in the Guadalupe Mountains: there wasn’t a single RV spot left, except for a TINY spot designated handicapped. But seeing the nightmare roadside experience we just had, I wasn’t about to go hunting for a place to park the RV, especially since we had driven out 60 miles from the last gas station. So, we made the tiny handicapped spot work, for the night. It was a tough tight fit, but we made it work. This meant that I wasn’t going to be able to go on a long run in the mountains as originally planned. I feared a ranger would come when I was gone and tell my wife we had to move it. I was thankful I stayed behind too; because we were told if another spot had opened up we needed to move. After we moved the RV to a new location I took the kids out on our first adventure of the weekend. 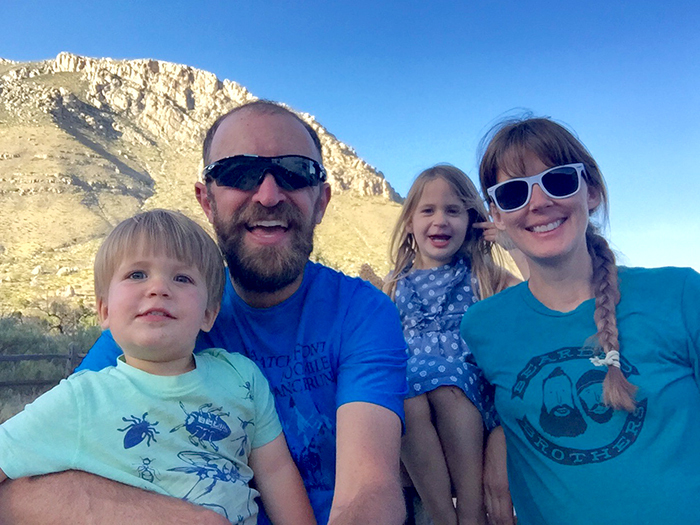 My original secondary plan was to summit Guadalupe Peak, but Kristy was feeling altitude sickness, so she stayed back in the RV to nap. The trailhead to most of the trails in the park was literally 10 yards from our door, which was really nice. I let the kids lead the way, and they chose a trail that lead to a cool rock feature called Devil’s Hall, but unfortunately the kids didn’t make it very far down the trail before they decided they were tired and wanted to turn back. Upon returning to the RV sites I killed some more time with them by playing outside so Kristy could get some more rest. 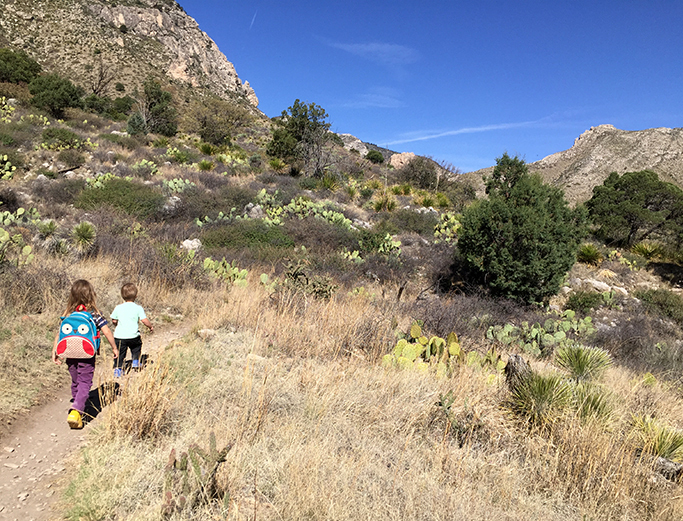 Josh and Abby hiking down Devil’s Hall trail in the Guadalupe Mountains. After Kristy finished her nap we ate some lunch and then put the kids down for their nap. Up until this moment in time I had been Mr. Grumpy Pants: all my friends were off running in the mountains and I wasn’t getting to be there like I wanted. Once the kids were in bed, and Kristy was cozy in her bed I took to the trails. Not having a lot of time I chose an easy 4 mile out and back to Devil’s Hall, which was a really cool cut-out in the rocks, caused by water cutting through it over time. After my romp in the mountains I was in much better spirits and fully ready to spend some time with my family. We took the kids on a hike that was close to a mile in total; they had lots of fun and enjoyed sitting at just about every bench along the easy paved portion of the trail. The trail was along the foothills of the mountain peaks, which make for some amazing views, and the trail had lots of informational signs about native plants. The next day was daddy’s, “big day.” I won’t bore you with all the details, but I went on an amazingly beautiful 19 mile run through the mountains that started from the campground and ended at another visitors center and trail head. Kristy and the kids met me there when I was done. When I got there the kids were covered in sand; they had been throwing on each other in the dry washout. I started the run around 4:30 a.m. and finished up just after 10:30am, I had arrived about an hour earlier than expected, so Kristy was relieved to know she wasn’t going to have to hike the kids back up to the trail head and then back down just to entertain them. So, after spending about 45 minutes in the washout watching the kids play we decided to pack up and head back to the RV for lunch. The kids, being covered in dirt, enough to fill a sandbox, got showers that afternoon before naps. They also napped really long and hard, and so did I, having been tired from my long run. After everybody awoke from naps it was already pretty late in the day, so we took a quick walk down to the visitors center to kill time and picked up a park map so I could get a better idea of the trails I ran earlier that day. The next morning got off to a crazy start. 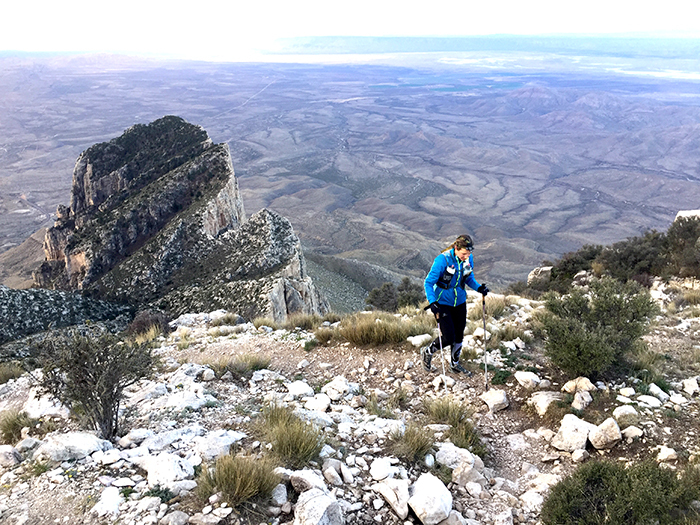 I woke up super early again for another trail run, this one to summit Guadalupe Peak, the highest point in Texas: but something wasn’t right… the lights in the RV were not working. I figured it was something wrong with the battery, as we had been having some problems with it throughout the week, so after getting ready for my run I checked the battery to discover one of the connections wasn’t fully on. No big deal I thought, Kristy could just turn on the generator in the morning to get the lights back on and turn on the heat (the heater hadn’t been cutting on due to the thermostat being out). 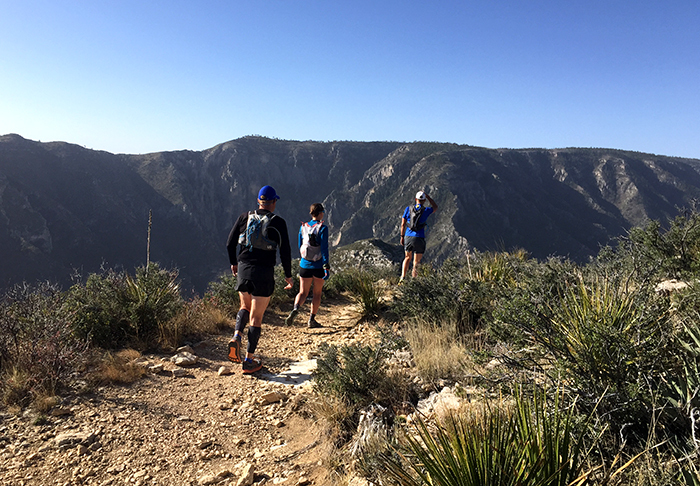 Summiting Guadalupe Peak with El Capitan in the background. So, while I was off summiting the tallest peak in Texas, Kristy was trying to figure out why the gas wasn’t coming on, but didn’t realize it was due to the thermostat being dead because of the dead batter, so she snuggled in bed with the kids and read them books, just waiting for my return. Upon coming out of the trail head the first person I see is Kristy getting back into the RV, I gleefully greet her, as I was excited to see her, but then I saw fire in her eyes. I had no idea what she had been dealing with while I was gone. But after explaining I didn’t think there was anything to worry about because we had the generator, she felt more at ease. I then quickly went to work connecting the battery back up and getting the generator going so we could get it charged back up again, and run the heater if need be. Having started my run super early, I was back around 8:30 am, which gave us plenty of time to eat breakfast and head off on a family adventure. This time we went to the Frijole Ranch historical museum and hiking trail. At the Ranch there is an old homestead house that is in amazing condition, and it was located right next to a spring that they used to irrigate a nearby orchard. The owners then took their produce and drove 60 miles by wagon over night to the nearest town to sell their delicacies at the market. After exploring the homestead location for a bit we hiked about a ways down the trail in the foothills to another spring. There were 5 within a 3-mile radius. The hike ended in a poop explosion, when Abby decided that nature was calling (she has no problem answering that call no matter where she is). Due to her poop marathon (it lasted forever) we had to cut the hike short and head back to the RV for lunch and naps. During the kids naps I was still feeling pretty good and decided to take to the trail again. I hiked up a portion of the Tejas Trail, the one I had done the day before in the dark. So I could see what things looked like in the daylight. I actually ended my hike just above Devil’s Hall – the hike I had done two days prior. So it was really cool to see the cutout in the rock from up high. Upon returning from the hike I was sufficiently satisfied, having run/hiked 37 miles the entire weekend. Pretty soon after I arrived back and the RV my children woke up and I got them up so that Kristy could nap longer. We played a bit outside, and explored some trails right next to the RV that went to some picnic areas. The rest of the afternoon we spent getting the RV ready for departure the next day. The next day we had a 4:30 a.m. wakeup call (central time: we had been on mountain time). The goal was to be on the road by on the road by 5 a.m but it didn’t quite happen the way I thought it would. Having pretty much everything secured from the day before, all I should have had to do was back up, attach, and drive away. But with the way this trip had started out I should have known it wouldn’t be so easy. The RV slot we were in had a severe horizontal and vertical slant, requiring me to raise the RV up really high to elevate it enough to back up and attach. The angle was causing the motorized jack to struggle, for a while I thought it wasn’t going to go up any further. 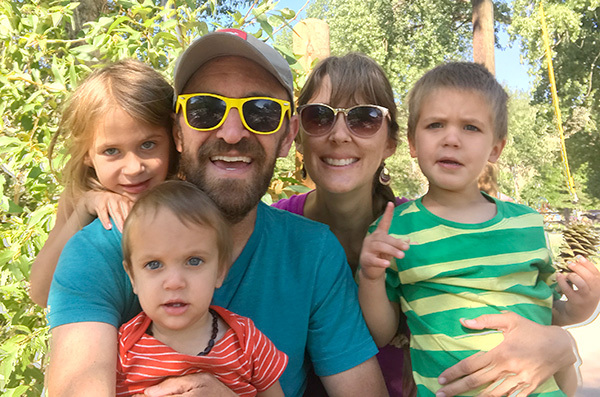 At this point the kids were still sleeping, and by the time I got attached it was time to load them up in the car, but first we had to pull in the slide… CLANK CLANK CLANK CLANK went the ratcheting system that brings in the slide. The severe angle of the lot was too much for the motor to handle (even though our new motor was supposedly the strongest one available). So, we carefully and slowly pulled the RV around to more level ground and loaded the kids up into the truck, said a prayer, and then hit the button. This time the slide came in without any problems. By this time it was already 6 a.m. central time. From that point on the trip home went really well, aside from missing the initial turn off just exiting the park, and some heavy rains near Austin. We arrived home with plenty of daylight left to get Thistle parked back in her lot. Heck we even got her backed into the EXACT same position we had her. She was exactly even with the jack blocks I left in the rear as place markers. This trip was pretty epic, but we had a great time. We are going to be parked here in Austin for quite some time now. We are expecting baby number three in September, and with all the truck repairs and RV repairs coming up we are going to need to stay put for a while. Traveling has been a blast, and really glad we got one last trip in before the next Simpson child comes into this word. But I would venture to guess as well that this will be the youngest Simpson to travel the wide-open roads.